Over the weekend, I had the opportunity to use the YOGA Tab 3. It’s mostly an entertainment tablet with very long battery life. But this new YOGA Tab revision has improved its design by including a cool feature called the AnyPen technology, a unique rotating camera and a near-stock Android interface. Long battery life with USB on-the-go (OTG) feature that allows users to charge other devices from the tablet. Dual front-facing speakers with Dolby ATMOS technology for a better audio experience. Rotating 8 megapixel camera for better selfies and video chats. AnyPen technology allows users to use the tablet with any conductive object. As always the YOGA Tab series can operate in four unique modes. Each mode is meant to simplify the user’s tablet experience. These modes are enabled via the unique kickstand. The stand has been improved to quickly release with the simple press of a button. The YOGA Tab 3 comes with an efficient Qualcomm 800 series processor, which is coupled with high-capacity cylindrical battery that provides long battery life. Plus with the USB OTG, users can also take advantage of these large batteries and use them to charge other devices while on the road. The new YOGA Tab 3 series is loaded with a near-stock version of Google’s latest Android 5.0 operating system. The design follows Google’s Material Design language, which provides a purposefully clean and efficient operating environment for the end-user. This basically means no bloatware on the design allowing us to install application that we need only. 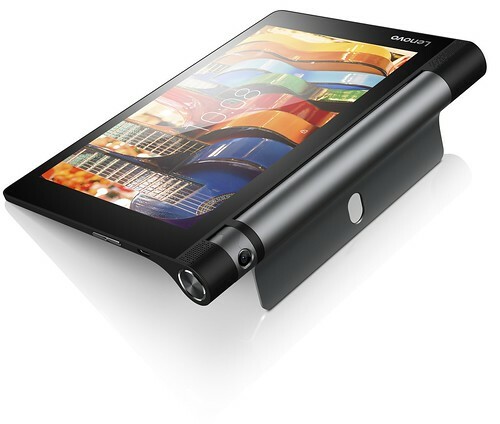 The YOGA Tab 3 comes with a 180 degree rotating camera. The advantage of this camera is that it adds the ability to position the camera at various angles. This opens up new ways for creative photography and camera usability. Additionally, instead of settling for a low-end front-facing camera, the device is equipped with a higher quality 8MP camera for front-facing functions like selfies and video chats. Lenovo’s AnyPen technology on the YOGA Tab 3 is designed to improve tablet productivity by enabling precise on-screen control for users. Instead of relying on a dedicated stylus, users can use any conductive object to interact with the screen such as a pen, pencil, keys, pocket knife, and even a fork.